Jan Damm began performing juggling shows for kids in central Maine when he was 12 years old. Since then he has toured nationally and around the world as a professional clown and circus artist. Highlights include headlining the production show on Celebrity Cruises ‘Silhouette’, Montreal’s ‘Complement Cirque’ Festival with ‘Midnight Circus’, playing Broadway with ‘Cirque Mechanics’, and performance intervention work in Haiti and Lebanon with ‘Clowns Without Borders’. 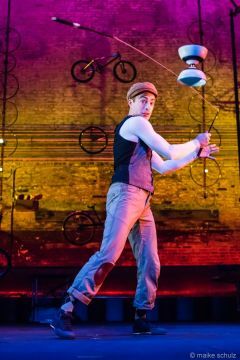 He’s been a coach for the Circus Smirkus Big Top Tour, appeared on David Letterman, and worked with Circus Bella, Circus Zoppe, Tandy Beal, Circus Flora, Flynn Creek Circus and Aloft Circus Arts, among others. With Ariele Ebacher, he created the eccentric duo act ‘High Spirits’. Jan lives in Chicago with his wife Ariele and their son Timo.